Fourteen graduate students from UC Santa Cruz's innovative Digital Arts and New Media MFA Program (DANM) will exhibit their work at the "2nd Biennial O1SJ Global Festival of Art on the Edge," June 4-8 in San Jose. UCSC's "Bureau of Disruptions" exhibit will join more than 100 other projects on display throughout the parks, museums, theaters and streets of the city's downtown area. Exhibitions at the festival will range from a hip-hop, multimedia meditation on Antarctica, to robot art, to operatic performances of Google headlines about the environment. 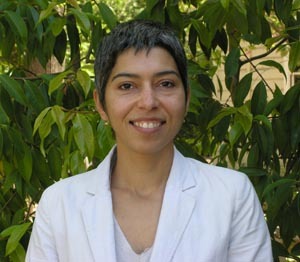 "This event provides a really wonderful opportunity for students because the festival is dedicated exclusively to the most cutting-edge and socially activated engagements with technology," noted DANM faculty member Soraya Murray, curator of the UCSC exhibit. "It provides an excellent venue for them to showcase their very impressive approaches to the use of technology." Murray explained that the project is titled "Bureau of Disruptions" because the students wanted to disrupt expected notions about a wide variety of subjects. For example, Michael Treanor has designed an alternative interactive game titled "Reflect" that places the viewer in the perspective of other living creatures; the player starts out as a worm and goes up the food chain, eventually ending up as a human. "As opposed to a typical violent or distracting game, his project inspires reflective, calm, dispassionate interaction," Murray noted. Another UCSC student, Will Justice, will present "The Human Morality Index (HMI)", a satirical pseudo-scientific web site that takes aim at our economic system, billing itself as "a real-time barometer of human moral capital." "It's not just technology for technology's sake," Murray noted. "The students' use of technology is not gratuitous-it's a very forward-thinking means by which they address social problems, moral challenges, or hopes and anxieties in relation to this burgeoning technology." 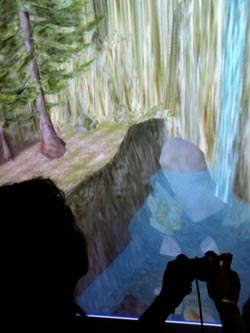 UCSC's Digital Arts and New Media MFA program serves as a center for the development and study of digital media and the cultures they have helped create. Faculty and students are drawn from a variety of backgrounds such as the arts, sciences, computer engineering, humanities, and the social sciences to pursue interdisciplinary artistic and scholarly research. The "Bureau of Disruptions" exhibit will be located at 333 West Santa Clara at the Comerica Building in downtown San Jose. The festival runs June 4-8, from noon to 6 p.m. with extended hours on Wednesday and Friday. Admission is free and open to the public. Collaborative student and faculty projects from UCSC's DANM program will also be on display during the festival. "Outfield"--an interactive kinetic installation made from a variety of sound-producing electromechanical objects--was developed in assistant art professor Ed Osborn's DANM Mechatronics project group and will be on exhibit at the San Jose Museum of Art. In addition, assistant UCSC art professor Elliot Anderson's project group has produced "Cathexispin"--a series of stationary bicycles that transform gym energy into art energy. The electricity generated by exercise will be used to power music and film performance during the festival, using analog devices and computer processing. For more information, go to web site or call (831) 459-1554. Contact the author at srapp@ucsc.edu.